In many states, different colors of lights used by EMS, police and other first responders can vary from state to state. Where a red light may be for an ambulance in one state, it may be the primary police light color in another state. Most people don’t realize that each state regulates the appropriate colors of emergency lights allowed on all vehicles. These laws include emergency police, fire and rescue, ambulance and other first response vehicles, as well as taxis, buses and both commercial and non-commercial street traffic. Flashing emergency vehicle lights are most commonly seen on police cars, ambulances, and fire engines. These vehicles, when they are moving in response to an emergency situation, have to be allowed to move faster than the other automobiles on the road. Flashing of emergency vehicle lights, together with sirens, ensures it. First responders who work full-time with departments and drive agency vehicles usually don’t think twice about the legality of their emergency vehicle lights. However, there is a group of first responders who are always questioning whether they are in the scope of the law. Volunteer firefighters, dive teams, physicians, county coroners, volunteer EMS, and many companies that use caution vehicles in their day-to-day activities often question whether they can use emergency vehicle lights and sirens on their vehicles. There are huge legalities involved with the utilization of this type of equipment, and the laws vary from state to state. Here, we will go over basic guidelines associated with this sort of gear and who is allowed to use it. As emergency vehicle light retailers, we are often pummeled with questions about the legality of our sales. Customers ask whether the lights and sirens we advertise are allowed to be used in personal vehicles, and this is where emergency vehicle light sales get complicated. Our products are available to the general public. However, not everyone can operate an emergency light in their car on public roads. What this means is you can purchase a light from us in any color, but whether or not you can use it on public roads in the United States is dictated by state statutes. Every state in the United States has written policies about who can and cannot use emergency vehicle lights. Some of the laws are laxer than others, but some even have restrictions on where lights can be mounted on a vehicle. Since state statutes vary widely from state to state, we cannot tell a customer whether gear they are considering buying can be used on the roads in their area. Instead, it is the responsibility of the purchaser, driver, and installer to make sure the lights they want to buy for their vehicle are legally allowed for use in the state they plan to operate it. To make sure customers understand emergency vehicle light state statutes, we recommend anyone who is considering purchasing lights from our online store make themselves familiar with their state’s laws before buying. An example of when warning lights can be purchased for use by civilians and used on privately-owned vehicles is when the equipment is going to be used for off-road and private use. Farmers and private security firms are one of the biggest markets for this type of sale. Farmers may want to outfit their ATVs, tractors, and farm transportation with warning lights for use on their property. Security agencies that patrol private properties such as company parking lots, amusement parks, private recreational properties, and malls may outfit their vehicles with warning lights. When these types of customers purchase warning lights, the purpose of the acquisition is to help patrol private property. Since most state statutes only apply to the on-road use, the laws don’t prevent drivers from using emergency lights on the private land. Everyone recognizes red, blue, and white lights on the road, but it’s important to note these colors aren’t the only ones allowed to be used on the road in some states. Green, yellow/amber, and purple lights are also recognized emergency vehicle light colors in many states. Green lights are considered in many places as courtesy lights, which means that the vehicle sporting that emergency vehicle light is requesting the right of way rather than demanding it. In some states, volunteer firefighters are allowed to use green lights instead of traditional red and white that is associated with fire departments all over the US. When a volunteer firefighter uses a green light on their personal vehicle, the law in that state views the device as a courtesy light. Since the unit is not recognized as an emergency light, Move Over Laws in that state might not apply to the situation. All white emergency vehicle lights are not a common sight on the road and are usually not operated by emergency vehicle drivers. Instead, if you see an all white emergency vehicle light set-up on the road, it is likely a caution vehicle. Caution vehicles are driven by utility companies, construction companies, storm chasers, and a few others. Since these vehicles are not emergency vehicles, these drivers cannot request the right of way from other drivers and must obey all traffic laws. Amber warning lights are the most permissive warning light color in the United States. What this means is that most states allow a variety of vehicles to operate yellow warning lights. However, state statutes still dictate when this type of lighting can be used. For instance, in Ohio, a construction vehicle or utility company vehicle can use amber lights while parked on the side of the road, but can’t operate warning lights when the vehicle is in motion. Purple warning lights are very rarely seen on the road today, and some emergency vehicle light retailers don’t even sell this type of gear because it isn’t popular. In states where purple lights are allowed to be used on car, it is usually restricted to use by funeral procession vehicles. Many people want to take their stock vehicle and turn it into something unique. One of the ways to do this is to change the lighting. However, not everyone can add strobe tube kits to their vehicles and operate them on the road. Many of the details concerning the legality of aftermarket strobe lights on the highway will vary from state to state. However, there are some common themes regarding this issue that are fairly universal. They are regulations that dictate both the brightness and positioning of strobe lights, as well as the color that they're allowed to be. If your vehicle is discovered to be in violation, substantial fines or other penalties are a likely result. First and foremost, emergency strobe lights that are either red or blue are, by and large, disallowed. There are some exceptions, but the general spirit of the law is that civilian vehicles should not appear to have the same features as those of police. Another general rule is that, regardless of color, there is a cap on how bright LED strobe lights can be. Typically, the limit is set at roughly the equivalent of the lighting power of 300 candles, but this is another parameter that can vary somewhat based on your location. The general idea here is that civilians can be allowed to have strobe lights, but that they shouldn't be bright enough to compete with other major lighting components of the vehicle. In other words, you can't have one that's as bright as, say, your brake lights. Extreme Tactical Dynamics is located in Jupiter, Florida. As a Florida business, we are very familiar with statutes regarding the use of emergency lights in our borders. Below, is a brief overview of Florida state laws concerning the utilization of the type of equipment we sell. Florida’s laws include regulation for the different colors of lights allowed on all vehicles. Only specially designated vehicles may display red or blue lights visible from the front of the car. While rear-facing lights such as brake lights are mandated to be red, only officially approved vehicles can show red lights visible from the front. In Florida, vehicles of the fire department, police, ambulances, the Department of Environmental Protection, the Department of Transportation, the Department of Agriculture and Consumer Services, and the Department of Corrections are allowed to use emergency lights in the case of an emergency. 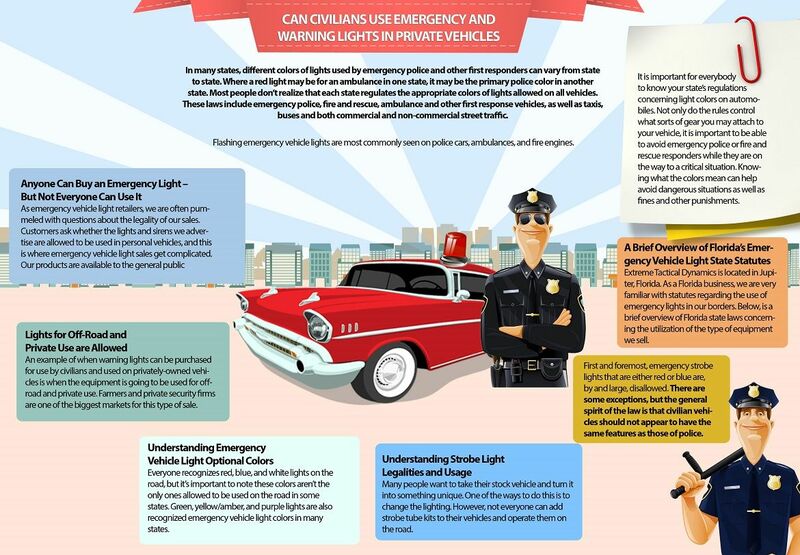 In cases of emergency, police, and other authorized vehicles may use emergency lights. In any other circumstances, only police vehicles may display blue lights. Florida’s statutes are clear on the prohibition of any other vehicle to display blue lighting anywhere on the vehicle. This ensures the easy recognition of police vehicles when using flashing lights during their duties. It is important for everybody to know your state’s regulations concerning light colors on automobiles. Not only do the rules control what sorts of gear you may attach to your vehicle, it is important to be able to avoid emergency police or fire and rescue responders while they are on the way to a critical situation. Knowing what the colors mean can help avoid dangerous situations as well as fines and other punishments.